Our compounding pharmacy has been involved in sterile compounding for nearly 20 years so is one of the most experienced sterile compounding pharmacies in the country. We are one of only a very few in Australia equipped with a NATA certified state of the art ISO Class 7 sterile room and an adjacent ISO Class 8 ante room which are required for the production of sterile preparations. 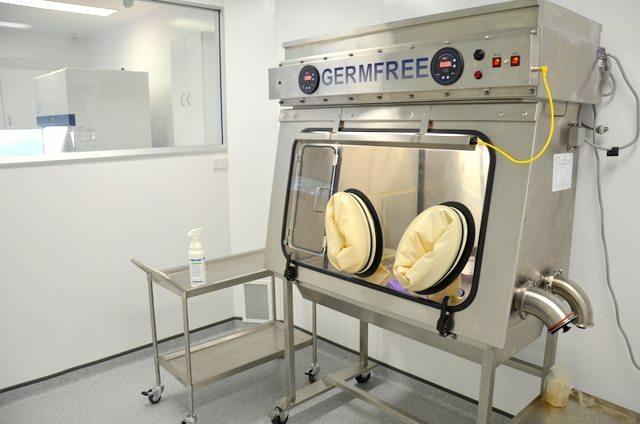 We have a NATA certified GERMFREE ISO Class 5 sterile laminar flow Barrier Isolator which is located in the ISO 7 sterile room in which all sterile preparations are made. This set up exceeds the requirements set by USP 797. These ensure that we exceed the high standards required for sterile production so that products produced by are us are indeed sterile and safe to inject. Our sterile laboratory is equipped with a validated depyrogenation oven to sterilize and depyrogenate all glassware and utensils involved in the compounding process to prevent contamination of bacteria or pyrogens. We also use commercially available sterile and pyrogen free water for injections, vials and filters in all our sterile products to minimize any potential source of contamination. Our sterile rooms undergoes daily bacteriocidal and weekly sporacidal cleaning to maintain a sterile environment. 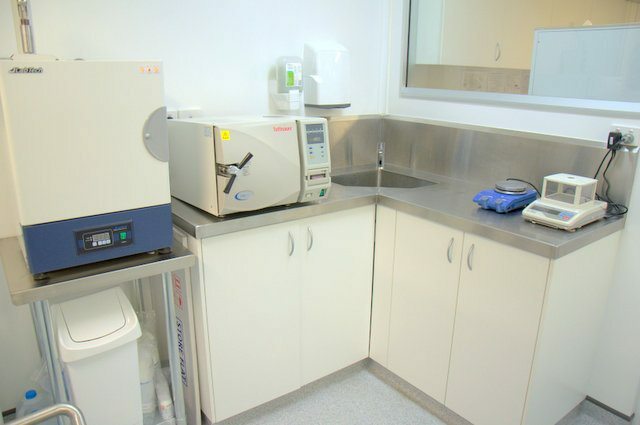 We also monitor the environment at intervals which exceed USP standards with weekly air sampling of the rooms and inside the sterile cabinet using a microbial sampler to ensure no bacteria are present. We also perform weekly glove finger dab plate tests in addition to weekly surface testing to ensure our sterile environment remains sterile. We also monitor non-viable airborne particals weekly to ensure we exceed USP 797 standards. We perform our own in-house sterility and endotoxin testing which have been validated for various products. Sterility testing involves incubating injection samples in various growth media in an incubator for 14 days to ensure the absence of any microbial growth. We also perform bubble point testing on our sterile filters to validate their integrity which ensures their ability to sterilize heat sensitive mixtures. We perform endotoxin testing on our raw materials to eliminate all sources of potential contamination. Dr Michael Serafin, our chief compounding pharmacist, has nearly 20 years experience in sterile compounding and prior to that in the 1990’s he had been involved in sterile work at the Department of Cancer Medicine Sydney University. In the early 2000’s he completed a Sterile Compounding Training Program with The American Society of Health-System Pharmacists and later in 2015 completed the Essential Elements of Compounding Sterile Preparations Course by Medisca. He is one of Australia’s most experienced compounding pharmacists in sterile compounding. Our facility is USP797 compliant. Erectile Dysfunction Injections – TRIMIX, BIMIX, QUADMIX and a range of other injections for the treatment of erectile dysfunction. Nutritional Injections – methylcobalamin, lipoic acid, pyridoxyl-5-phosphate, carnitine, phosphatidylcholine, dexpanthenol, etc. Refer to our Vitamin Therapy page for details. Since 1st Feb 2018 new sterile compounding guidelines took effect in Australia whereby all sterile compounding pharmacies must abide by USP797 standards. As we had previously been voluntarily following the majority of this standard, and exceeded it in various situations, the change in guidelines did not effect us significantly except now the supply of certain products stored in the fridge will be delayed to allow for sterility testing if extended expiry dates are required. This also adds an additional cost to cover sterility testing.